Holy Shiz! 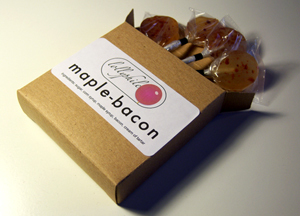 Maple Bacon Lollipops?! Thanks to an article in The Thrillist I have become obsessed with having these as the favors at our wedding in June, even though we already have the favors. Not only does Lollyphile use “sustainable, organic, cured bacon” and “pure Vermont maple syrup” but they also offer an Absinthe variety!!! I’m going to be sitting by the mailbox like a crackhead waiting for a drop off until I get these samples. Update:These things are amazing!!! I couldn’t believe how truly great these tasted. I think I’ll end up getting the (beautiful) Absinthe for the favors and the Bacon one’s for the VIP’s. This guy’s a genius! This entry was posted on April 30, 2008 at 5:13 pm and is filed under Food News, Product Review. You can follow any responses to this entry through the RSS 2.0 feed. You can leave a response, or trackback from your own site. Wow that is genius…you need to get started on your chewing gum idea right away…of course if you do I’m volunteering to be a taste tester!